There is something that should be born in mind by all churches Fundraising should always be fun and engage people with both the church and each other. 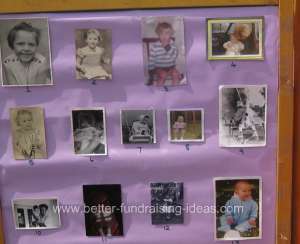 Fundraising with a Baby Photo Competition. Ask members of your clergy, choir, church-wardens and prominent members of the congregation to bring in a photograph of themselves as a baby or young child. You need between 12 and 20 photographs. Scan the photos and return the originals to their owners. At the same time take a current picture. The idea will be for people to match the baby photo to the member of the church community. Have all the pictures blown up to A4 (21cms X 30cms approx). Give each baby photo a letter and each current photo a number. Pin them up on a wall or display board. People buy an answer form on which they try to match the correct photos. All correct entries are placed in a draw which is made at the end of the fete when the true identities of the babies are revealed. Make up a simple sheet with the photos on one side and the entry form on the back. Run the competition in your Parish Magazine or hand out the forms at the end of a service. You may like to add intriguing little notes such as sporting achievements or youthful pastimes of the mystery subjects in the baby photos. As an extra bit of fun you could also ask contestants to nominate the photo they think is cutest! Nothing like a bit of friendly competition amongst the congregation! Got a computer nut in your congregation? Put their skills to good use and devise a way the whole thing could be done on-line. This is also a great way to promote your church web-site and attract visitors to it. Fundraising is always easy if you keep the ideas nice and simple. would have looked so cute as a baby!